Janetti Marotta, Ph.D. | Resume - Janetti Marotta, Ph.D.
Marotta, J. 2018. A Fertile Path: Guiding the Journey with Mindfulness and Compassion. North Charleston, South Carolina: CreateSpace Independent Publishing Platform. Compassion. Oakland, Calif.: New Harbinger Press. -Translated in French and Italian and printed in hardback New York: MJF Books in arrangement with New Harbinger Press. 2015 & 2016. Marotta, J. 2009. Stress Reduction Techniques to Reduce Patient Dropout Rates During eSET. Chapter in Single Embryo Transfer. Pages 159-170 in Gerris, J., Adamson, GD., DeSutter, P. & Racowsky, C. (Eds). Cambridge, UK: Cambridge University Press. -Translated in Italian in booklet for Momento Medico, Italy in arrangement with Cambridge University Press. 2010. Outcome and Feasibility. Journal of Consulting and Clinical Psychology, 57(5), 619-622. Marotta-Sims, J., Nishi, L. & Kolinsky, B. 1980. Autism Project In-Service Manual and Autism Project Sound Film Strip. Mendocino County Schools. Emotionally Insecure Youth? Psychotherapy: Theory, Research, and Practice, 10(4), 348-351. The Paradoxes of Infertility. RESOLVE of N. Calif. Newsletter, Fall, 1999. A Gift from God. RESOLVE Illinois Newsletter, Winter, 1999. The Heart of Surrogacy. RESOLVE of N. Calif. Newsletter, Winter, 2000. Between a Rock and a Hard Place. RESOLVE of Northern California Newsletter, Spring, 2000. Opening to the Surrogacy Experience. Organization of Parents through Surrogacy Newsletter, Fall, 16,1997. The Surrogacy Experience. Organization of Parents through Surrogacy Website, 1998. Nursing from your Soul: How to Nurse your Baby from Adoption or Surrogacy. Organization of Parents through Surrogacy Website, 1998. 50 Mindful Steps to Self-Esteem–Website Interview. Tiny Buddha. June, 2015. Mindfulness: A Great Wellness Goal for 2015. Los Altos Town Crier. January, 2015. Infertility Treatment—How to Cope. My Life Stages Sutter Health Ask the Expert Healthy Living Blog. April, 2015. Greeting Pregnancy with Mindfulness. Beyond Infertility. December, 2014. Giving the Presence of Mindfulness. Beyond Infertility. December, 2014. Give Yourself the Gift of Mindfulness. Palo Alto Medical Foundation Health Blog. December, 2014. The Paradox of Self-Esteem. Santa Clara Country Psychological Association Newsletter. Winter, 2014. 50 Mindful Steps to Self-Esteem. Interview with Janetti Marotta and Michelle Skeen. Relationships 2.0 Radio. May, 2014. Mindful Self-Esteem: An Interview with Janetti Marotta and Lynn Crocker. Create Your Reality Radio. April, 2014. 50 Mindful Steps to Self-Esteem. Website Interview with A.R. Silverberry. March, 2014. Improve Inner Awareness and Live a Life Free of Harsh Self-Judgments with 50 Mindful Steps to Self-Esteem. New Harbinger Publications Consumer e-Newsletter. December, 2013. How to Use Mindfulness to Help Clients Move Past Distressing Emotions. Quick tips for therapists. New Harbinger Publications Consumer e-Newletter. December, 2013. Marotta, J. 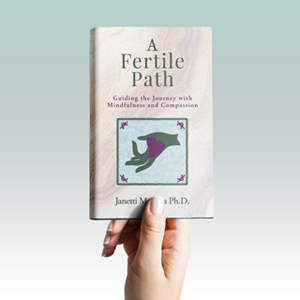 Seminars on 20+ infertility/mind-body topics. Palo Alto Medical Foundation Fertility Physicians of Northern California, Nov. 2006-current. Marotta, J. Mindful Self-Esteem—A Six Week Series. Insight Meditation South Bay, May 10-June 14, 2018. Marotta, J. Mindfulness Meditation—Eight Week Class Series. Exubrancy at Tintri, Inc., August 2017-current. Wesson, N. & Marotta, J. The Essentials for Starting and Leading Psychotherapy Groups. Presented for Life Moves by Center for the Study of Group Psychotherapy: Oct. 2016. Marotta, J. Mindfulness. Trinity School: Feb. 2016. Marotta, J. Seven Factors of Awakening—Mindfulness. Insight Meditation South Bay: Apr. 2016. Marotta, J. & Miller, C. The “Ins and Outs” of Professionally Led Support and Psycho-Educational Groups. Center for the Study of Group Psychotherapy: Nov. 2015. Marotta, J. Eight Great Thoughts: An 8-Week Speaker Series based on Anuruddha Sutta—Mindfulness. Insight Meditation South Bay: Apr. 2015. Marotta, J. A Series on Strengthening Mindfulness—The “Presents” of Mindfulness. Insight Meditation South Bay: Apr. 2015. Marotta, J. & Wesson, N. Mindful Self-Esteem Practices within a Psychotherapy Group. American Group Psychotherapy Association National Convention: Feb. 2015. Marotta, J & Wesson, N. Mindful Self-Esteem Practices within a Psychotherapy Group. Center for the Study of Group Psychotherapy: Oct. 2014. Marotta, J. Mindful Self-Esteem: A Course in Cultivating Qualities for Self-Acceptance and Self-Compassion. Santa Clara County Psychological Association & Center for the Study of Group Psychotherapy: Feb. 2014. Marotta, J. 50 Mindful Steps to Self-Esteem: An Evening of Meditation & Teaching. Insight Meditation South Bay: Feb. 2014. Marotta, J. & Sims, G. Book signing event–An Afternoon of Mindfulness and Peace. Lucie Stern Center: Jan. 2014. Marotta, J. The Mind-Body Approach to Chronic Pain. Agile Physical Therapy Center–staff training, Jun. 2007. Marotta, J. Symposia presenter on 20+ infertility/mind-body topics. RESOLVE of Northern California, Jun. 1997-Oct. 2005. Marotta, J. Marital Variables & Treatment Completion, April 1986; Differential Effects of Marital Status on Treatment Completion: Addicts vs. Alcoholics: Annual Conference of the National Council of Alcoholism: Apr. 1986. Marotta-Sims, J.: The Continuity between Dreams and a Vision Quest; Marital Status and its Relationship to Alcohol Inpatient Treatment Attrition; The Sense of Injuring and its Relevance to Analog Research on Aggression. Western Psychological Association Convention: Apr. 1984. Palo Alto Health Care System (1984-1991). * References available on request.